I've been wrestling with this episode for several years. There's a argument it could count as a Christmas episode, but it falls just short of the litmus tests we use. Fortunately, while I can't quite justify this as a Christmas episode, it's a perfect example of the Christmas in July trope. The episode starts with the same initial hook most Christmas in July pieces open with: the heat's too oppressive to deal with. 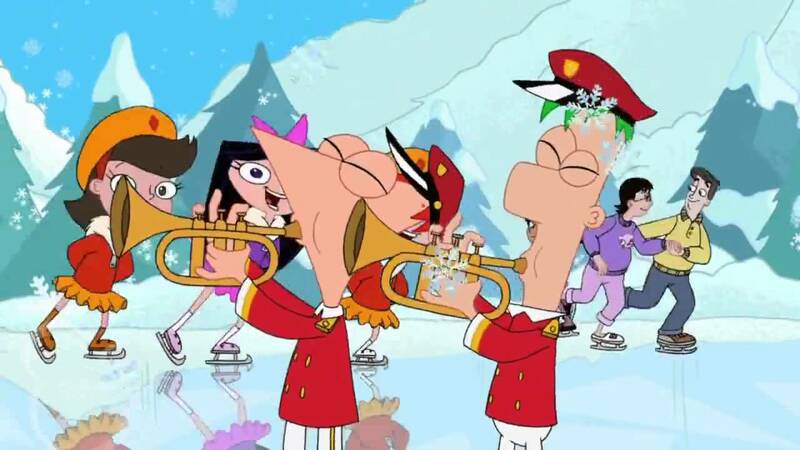 In fact, the episode makes it clear that it takes place in the month of July (the vast majority of Phineas and Ferb occurs at an unspecified point in the summer - calling out the month is almost certainly a nod to the trope). Before leaving for an antique sale, their parents give the boys a snow cone machine to help them beat the heat. As is often the case, Phineas and Ferb like the concept but not the scale. Using a massive amount of ice and a number of air conditioners, they create a snow-covered mountain in their backyard, complete with a ski lift, ice fishing pond, bobsled track, and countless other absurdly impossible additions. From here out, the focus shifts to their sister Candace, who sets out to bust her brothers before getting caught up in teenage drama surrounding her future boyfriend, Jeremy, and a foreign exchange student, DD, who she becomes jealous of. And of course their pet platypus, Perry, is called by the top secret government agency he works for to thwart his nemesis, who's attempting to use a massive laser (well, technically a melt-inator 6-5000) to melt and steal the city's chocolate. The episode uses the inator as a fake-out for what's going to happen to the boys' snow mountain. Instead of using the obvious solution, the inator shorts out the city's power, and - without the air conditioners to keep it from melting - it disappears before Candace can show it to their mother. While I doubt this makes many top 10 lists, it's a solid episode. There are some hilarious visual gags, several clever twists, and a catchy song about the fused seasons in a style kind of reminiscent of the song "Sleigh Ride," complete with close harmony a la the Andrews Sisters. That song's a good transition point into the holiday elements. Both tonally and lyrically it blends sounds and ideas associated with the conflicting seasons. Christmas is never mentioned directly, but there's a line about sleigh bells (as well as a constant jingle in the background), and another line describing it as a "S'Winter 'swonderland," parodying the holiday classic. While the episode's holiday cred is debatable, the song absolutely counts as Christmas music. And, while it never name-drops it, there's an argument this may be the definitive Christmas in July song. They also use holiday imagery, including picturesque giant snowflakes and pine trees (growing inexplicably on the newly-formed mountain of snow). In addition, the snow cone maker responsible is shaped like a Christmas tree, though this is never discussed. On the spectrum of Christmas-in-July, this represents the snow-covered holiday transposed onto the hottest period of the year. Like every episode of Phneas and Ferb, this is worth seeing. Re-watching it after seeing later installments is a little jarring - Phineas's voice is a little higher pitched and less expressive than it would later become, and there are a number of design and character elements that would change as the show developed - but it's worth it for the jokes. I'm going to try and keep this one short, because its holiday elements are few and far between. In fact, they never really show up in the A-plot, at all. However, they represent a very different aspect of the Christmas in July tradition and are just relevant enough to justify inclusion (at least in this Christmas geek's opinion). The main story line concerns Phineas and Ferb building a small army of robotic versions of themselves to build several projects at once. In keeping with the premise, they lose control over their creations, who turn on them. Not in keeping with the premise, they thought to build a remote control. While all this is going on, their sister, trying to prove her brothers are mad scientists, grabs one of the brobots and tosses it in a sack. Her plans are thwarted by a conveniently timed garbage pickup and fertilizer drop off. I promise, there is some Christmas in this thing. Early in the episode during the requisite "Where's Perry?" moment, Agent P activates a hidden elevator inside the chimney. On the way to his lair, the elevator stops on another floor, and Santa hops in. A few jokes are dropped here and in the next scene, and the story moves on. 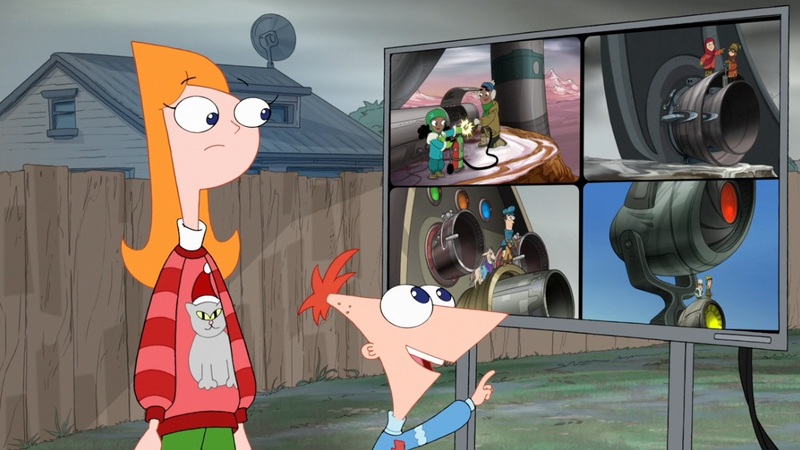 Doofenshmirtz's evil (well, sort-of evil) plan this episode is to use a giant magnet to erase the recordings he left on his girlfriend's answering machine. 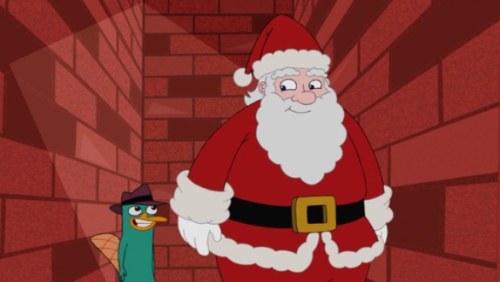 At the end of the episode, he tries to drop the magnet on Perry, only for Santa to swoop in on his sleigh and carry it off. 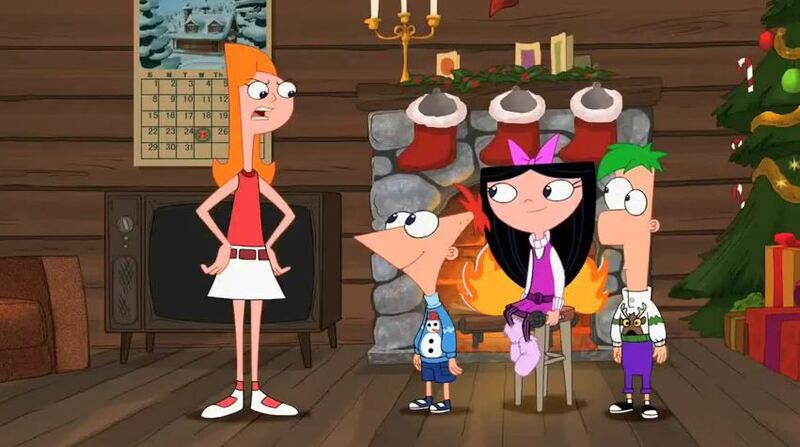 During this, Doofenshmirtz expresses disbelief at Santa's presence, pointing out it's the middle of July. Following this, Santa flies over Phineas and Ferb's house, and the giant magnet drags the robots away, removing the evidence. Granted, Santa's appearance and effect on the story were relatively interchangeable - they could have used the same intro/callback in dozens of different episodes without impacting the plot. Setting that aside, it does illustrate a rare alteration on the Christmas in July (which, again, the episode was careful to specify) trope: Santa in the off-season. Setting all of that aside, this is a fantastic early episode. The writing's on point, the joke are hilarious, and the song - an 80's-style synth tune about robots - is a lot of fun. If you've never seen an episode of Phineas and Ferb and want a quick look at why the series is worth your time, this would be a great pick. Yes, yes. I realize I already reviewed this back in 2012, but it's too perfect a fit for this "Christmas in July" thing not to revisit. Besides, that was in the middle of our lazy period, when we'd write a few hundred words and call it a day. Honestly, I wish I could justify revisiting Phineas and Ferb: Christmas Vacation as part of this, as well. I've seen that a few times since I gave it a somewhat tepid review, and it's really grown on me. But that definitely took place over Christmas Vacation (it's in the name and everything), so I'll have to put a pin in it and wait for a later time. The 2011 "Phineas and Ferb's Family Christmas Special" opens with a similar premise to S'Winter - Phineas expressing an interest in cooling off during the hot summer months. But instead of following the show's usual structure, it pivots into an animated version of a classic Christmas special, complete with a log cabin, forced drama, and an abundance of musical numbers. 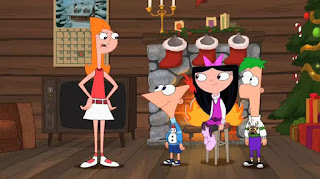 Doofenshmirtz - in a slightly less evil than normal twist - builds a teleport-inator to beat the crowds he thinks are flocking to the stores to do their Christmas shopping (he mistakes the live broadcast of the Phineas and Ferb special as meaning it's actually the holidays). Due to the format and extra songs, the episode is light on plot. Candace tries to bust her brothers, as usual, but her efforts feel much more muted, culminating in a very sweet moment between her and the boys. 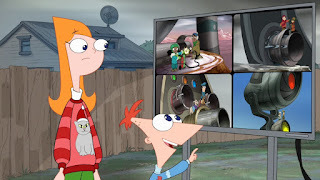 There's a short fight between the semi-aquatic mammal and the mad scientist involving wrapping paper and fruit cake, which concludes with Perry teleported back to Phineas, then the entire set dropped into Doofenshmirtz's living room. The episode also guest stars Kelly Clarkson, who - in an extremely clever twist on a Christmas special cliche - doesn't wind up singing. Instead, the musical numbers go to the series regulars. Isabella sings an adorable version of Let it Snow, Buford and Baljeet do a parody of Good King Wenceslas (and still find time to offer some historical context), and the show wraps up with a modified version of We Wish You a Merry Christmas. The "Christmas in July" aspects are somewhat muted by the fact this was clearly intended to be watched at the holidays - it's essentially a Christmas special masquerading as a Christmas in July one. That said, there are some elements we've seen in other Christmas in July pieces, starting with a warm summer day being the catalyst. This also had an early Christmas spreading confusion, another trope associated with Christmas in July. On its own, it's a fun episode. The Buford/Baljeet song takes a great turn that will be appreciated by longtime watchers who understand there's way more to Buford than his exterior would suggest, and the Clarkson gag really is clever. It's by no means the best episode of the series, but it's absolutely worth watching. But - and this certainly isn't the first time I've said this - the same goes for every episode of Phineas and Ferb. This was a phenomenal animated series containing comedy, heart, and a surprising amount of philosophy. If you've never seen an episode, start with the first and keep watching until you're hooked. You might not understand my affection at first, but trust me - give it time, and you will. This two-part (that's two 30 full minute episodes, not two half episodes) has very tenuous Christmas connections, even more so than I, Brobot. In fact, the only time Christmas is referenced in any way is when the kids put on Christmas sweaters due to the cold. That said, this embodies yet another aspect of the Christmas in July tradition: a near-apocalypse of eternal winter. In the context of this episode, the broken seasons have nothing to do with Christmas. Actually, it's got very little to do with anything - Doofenshmirtz simply bought the wrong sunscreen. To correct this, he's planning on moving the Earth further from the sun, so he can get by with a weaker SPF. When his colleagues in LOVEMUFFIN (the poorly-named organization of supervillains) discover what he's done, they have bigger plans: they capture all of OWCA's agents, build a larger version of Doofenshmirtz's device, and hold the world hostage. With Major Monogram fired (long story including one of the episodes better gags), there's seemingly no one to stop them. Meanwhile, Phineas, Ferb, and friends know nothing about this. They do, however, piece together than the Earth's been moved for some reason. Getting help from elsewhere on the planet, they develop a system of giant rocket engines they can use to nudge the planet back where it belongs. I'm skipping over quite a few details - as I said, this isn't really Christmas, and I'm mostly interested in where thematic elements intersect with Christmas in July tropes. And that really boils down to the concept of the seasons being undone. In a real sense, this fear lies at the heart of Christmas, a holiday marking the turning point when the days once again begin growing longer. I doubt that was an intended aspect of this episode (though it is conceivable the decision to put the kids in Christmas sweaters was more than a gag). Still, it's a version of the trope we're covering, so it's worth mentioning. Even if, this time, they specified the episode was set in August instead of July.